Explanation: What's lighting up nebula IRAS 05437+2502? No one is sure. Particularly enigmatic is the bright upside-down V that defines the upper edge of this floating mountain of interstellar dust, visible near the image center. 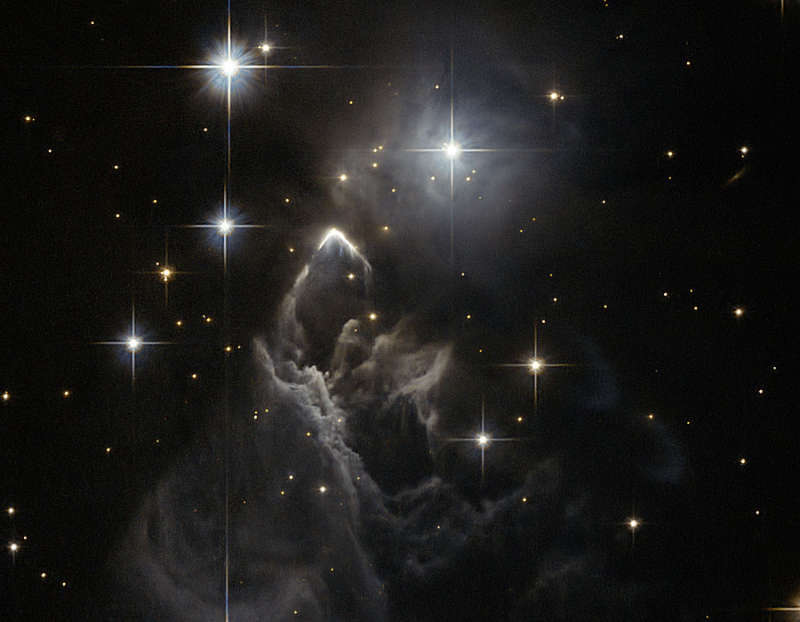 In general, this ghost-like nebula involves a small star forming region filled with dark dust that was first noted in images taken by the IRAS satellite in infrared light in 1983. Shown above is a spectacular, recently released image from the Hubble Space Telescope that, although showing many new details, has not uncovered a clear cause of the bright sharp arc. One hypothesis holds that the glowing arc was created by a massive star that somehow attained a high velocity and has now left the nebula. Small, faint IRAS 05437+2502 spans only 1/18th of a full moon toward the constellation of the Bull (Taurus).